(CNN) -- Talking trash has taken on a whole new meaning in Gary, Indiana -- where residents have taken their trash and their talk to the steps of City Council. Gary, Indiana, has not had garbage collection since July 12. Pick-up is set to resume Wednesday. Residents in Gary have not had trash pick-up since July 12, when Mayor Rudy Clay ordered garbage collections halted as part of an ongoing dispute between City Council and his attempts to outsource the job to sanitation giant Allied Waste. But the issue was solved Tuesday night when the council voted to continue their contract with Allied. 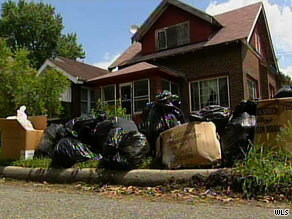 Garbage that had piled up for nine days will be picked up Wednesday. "The people will be happy when this garbage is picked up," the mayor said Tuesday night. "We don't deserve to have all this garbage on the streets. The saga came to a head on Monday morning when dozens of protesters, with full trash bags in hand, arrived at city hall to criticize the mayor. The group, Miller Citizens Corporation of Gary, is angry about a $12-a-month trash tax, a $5 million no-bid contract with Allied, and dozens of laid-off city garbage workers. The group filed suit against the city last November on two counts: it claimed the contract with Allied was not submitted for public bids, and the trash fee may not be levied without City Council approval. In February, Judge Thomas Webber of Lake County -- where Gary is located -- ruled the Allied contract null and void, and mandated the city to stop collecting the tax until it was approved by the council. However, Allied continued to be paid monthly. The City Council voted against the trash tax on July 7. The mayor then ordered Allied to stop collecting garbage, saying the city couldn't afford to pay the company. Defending his $5 million contract with Allied on the steps of city hall Monday morning, the mayor said, "The old system cost the tax payers $9 million a year and received 40 to 50 complaints a day." He also said that maintenance costs were costing the city $600,000 a year. As Mayor Clay spoke, in front of the bags of trash, a scrolling sign on the City Hall property flashed "Keep Gary Clean. Let's Pick It UP!" CNN's Kara Devlin contributed to this report.